Made of a heavy duty, soft, yet durable, neoprene material, the Trident Ankle Weights have quick release on/off clips, and easy to adjust velcro straps. Available in three sizes, Black only. Isolate the legs to give you a great core, legs and lower body swim fitness workout while improving your stroke form. 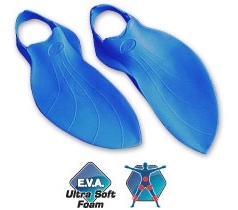 EVA foam design not only maximizes comfort but also makes the fins float - no more diving down to retrieve lost fins! Not only strengthens and tones but improves your swim technique. Available in blue and silver models in sizes 13(kids)-12. Designed for lower body strength development, Aqua Sphere Zip VX Fins feature mid-length blades which are relatively flexible, compared to other training fins. Aqua Sphere Zip VX Fins are ideal for professional athletes due to their narrow construction and non-slip fin rails for a powerful push-off. 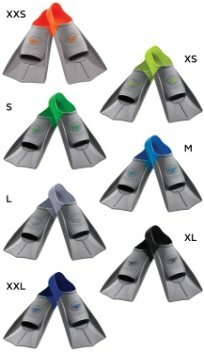 But these adjustable open-heel fins are also popular among beginners and older adults for their incredible ease-of-use and flexible, fatigue-reducing blades. The flexible channels amplify each kick by creating a "springboard effect", while propulsion is made easier by the fin's signature Vortex Channel. 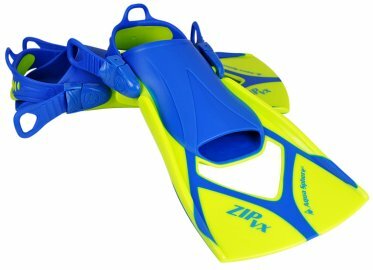 Open water swimmers, fitness swimmers, and recreational swimmers alike prefer Zip VX Fins for their compact size, zippy propulsion, and versatility. Aqua Sphere ErgoBeltâ„¢ helps maintain a buoyant vertical position in the water while performing an aquatic fitness workout. The ErgoBelt is ideal for full, upper, or lower body workouts. 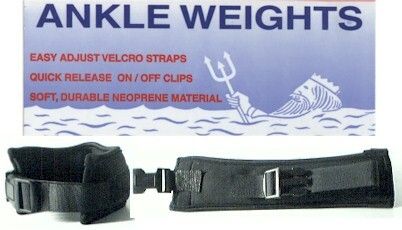 Use in conjunction with sidefloatsÂ to add further buoyancy stability. Now: Free Aquatic Fitness Workout Guide with purchase.Â A $10 Value! 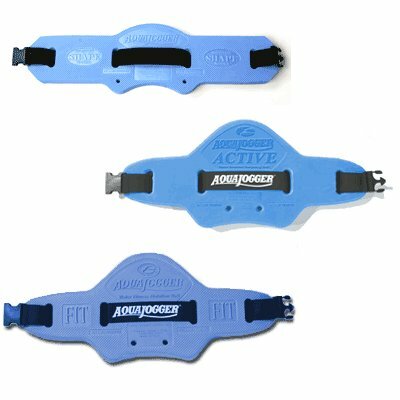 Aqua Sphere Side Floats work with the ErgoBelt to add additional vertical buoyancy stabilization while performing aquatic fitness workouts. 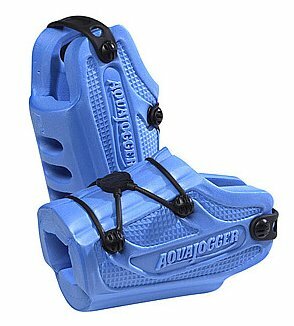 The Aqua JoggerÂ® Aqua RunnersÂ® are designed to enhance your deep water workout by increasing surface area resistance, intensity and workload. The soft, comfortable, slip-on foam footwear can be worn on your feet or hands to offer a low-impact workout for your lower and upper body. The AquaJoggerÂ® design tones the abdominal muscles without doing a single sit-up due to the continual use of abdominal muscles to maintain correct posture. To accomodate different body shapes, belt can be worn upside down or with the foam in front of the body. 48" black elastic belt will fit up to a 44" waist. Foam dimensions: 25 3/4" length 11" width 1 3/4" thick. Dual density foam offers maximum comfort and support. Great for single arm and sidekick workouts. 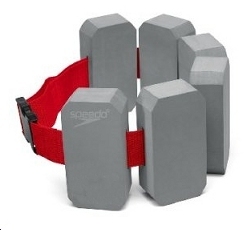 Strengthens legs and reduces shoulder stress. 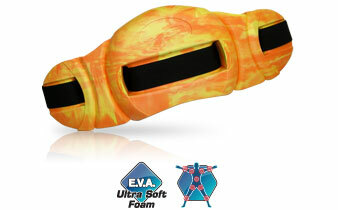 Lightweight and durable EVA foam. Helps to develop upper body strength by suspending and floating your legs. 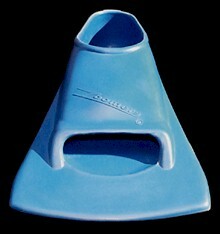 Soft silicone short blade training fins help you develop a stronger, faster flutter kick. 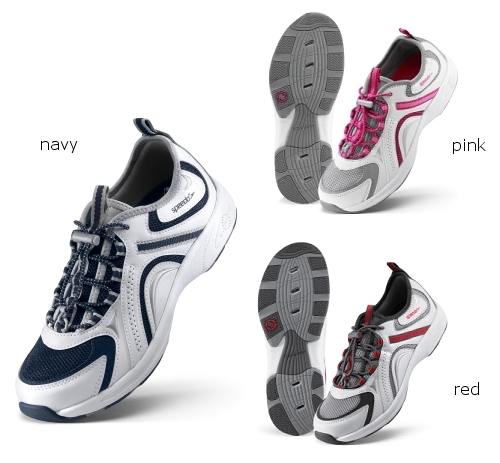 Super-soft silicone foot pocket provides extended comfort and secure fit . Short, straight blade helps maintain proper kick/stroke tempo. 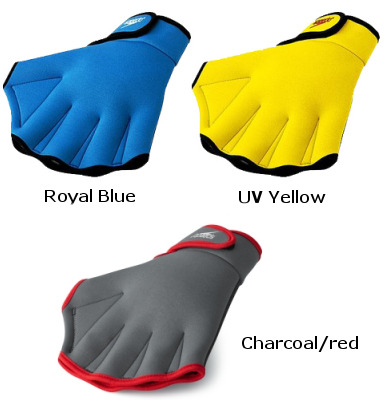 Neoprene glove with webbed fingers features a rubber palm. Hit the water with Speedo's Hyro Trainer Aqua Shoe for women! Hydro TreadÂ® rubber outsole for water dispersion & maximum traction. Featuring 360Â° Ventilation for maximum breathability. 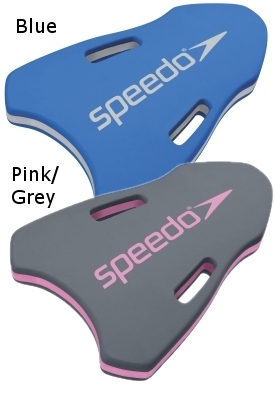 Speedo FoamÂ® provides shock absorption & long lasting comfort. 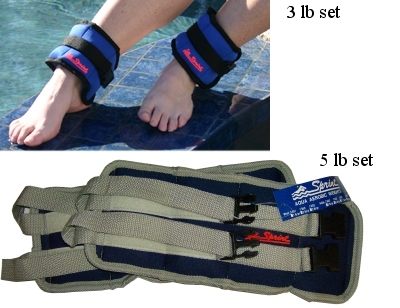 Ankle Weights are great for vertical traction in the water and on the land. 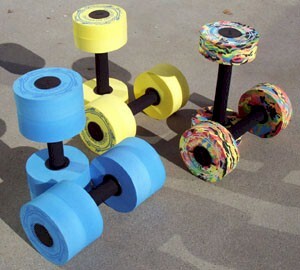 5 LB set: each weight is 2.5 pounds, for a total weight per pair of 5 pounds. 3 LB: each weight is 1.5 lbs for a total weight of 3 lbs. The Sprinter Tether is ideal for a small pool to swim or exercise in place. 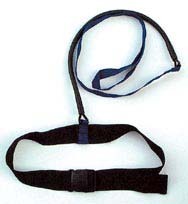 The 5-foot tether will stretch to 9 feet with a 44-inch adjustable belt. MADE IN THE USA!!! 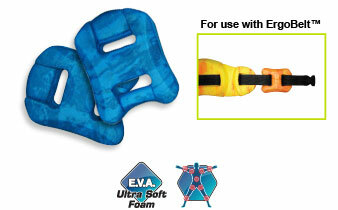 Made of high density EVA foam that will not absorb water. Fully adjustable, for secure fit. Patented design that allows the individual to float vertically, relieving stress on the lower back. 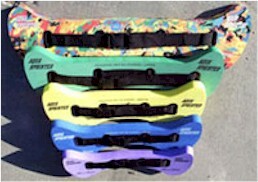 Zoomers are the leading training fin used by competitive and fitness swimmers. The wide blade puts resistance on your legs to build muscle strength and ride high in the water, but the blade's short length help you kick quickly and improve stroke balance between arms and legs. 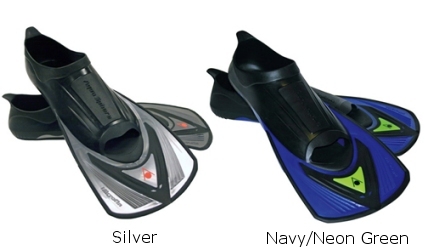 The most popular type of fins available for training! 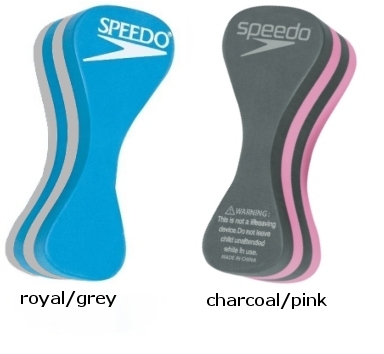 Red (stiff): For competitive and aggressive swimmers, or swimmers with excellent ankle flexion. 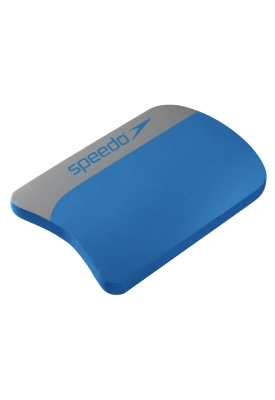 Blue (more flexible): For fitness and long distance competitive swimmers. 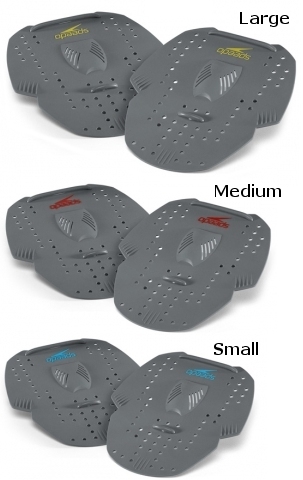 The blue fins will not prematurely fatigue the legs like the red fins! We offer the blue fins only.